We feed on demand, and will continue to until we feel it’s a good time to stop. Likely once he’s eating food along with his milk. I also plan on adding cereal to his nightly bottles in a few weeks. They say he must sleep on his back at all times. My kid has been sleeping on his stomach since the first week of his life. On his back he startles himself awake every 2 seconds and doesn’t stay down at all. We recently started putting him in his boppy if he passes out before being burped so he’s a bit more upright. Apparently that’s another big no no. I say, if he’s turning his head and lifting his head then he’s OK to sleep on his tummy. I don’t know if it’s a “rule” per se but in general babies are kept in diapers at all times. John’s not with me on this one, but I let Rohan “breathe” after he’s taken a big potty. I’m not practicing elimination communication or anything extra crunchy like that, I just want him to get some air on his downstairs. Wanna keep him rash-free without lubing him up w/ A&D all the time. We’re doing a delayed vaccine schedule and opted out of the pertussis vaccination for both of us. We also opted out of the Hep B vaccines until later. Did you go by the book with your babies or did you break some of the rules? We defied the back-only rule. When I saw Nia lift her head at 8 weeks and peer at me over her co-sleeper I knew she was strong enough. It definitely helped the sleep situation! Mommy knows best, right? I put both of mines on their stomach as a baby they would not sleep on their back at all kept getting up and I was dumbfounded as to why so my mom said put that baby on his stomach soon as I did I slept for at least 4 hours which was a miracle. We defied the back rule. He wasn’t sleeping more that 20 mins on his back. The first time he slept on his stomach he was out for 2-3 hours! My in-laws kept asking why I wasn’t giving my son water. He didn’t get his first taste of water until it was in a sippy cup around 9months, I think. haha… love this post. It’s crazy how all the “baby rules” change every 5 years! – Started him on cereal in his bottle at 3 months. – We’ve been sitting him up since he was 2 months old… he just prefers that to lying down all the time. – We were out shopping the day after we got home from the hospital…went on a picnic too. We want him to be as exposed as possible. – He’s been on a boat. – He’s tried my raspberry chocolate chip ice cream…off my finger…and loved it. We followed most of the rules except Hep B. I so did not want to give my little girl a Hep B shot when she was born, we delayed that. For the most part (at least in the beginning), she slept on me while I slept sitting up. When she wasn’t doing that, she was on her back and had no problems with that. Honestly, it’s what works for mommy and baby at the end of the day. Rules are meant to be broken. I honestly don’t know anyone who doesn’t break the rules a bit. As long as you are comfortable with whatever rule you are breaking then I say go for it. I from the Caribbean and we as babies were placed on our bellies and grew up seeing babies placed on their bellies to sleep. So most naturally when I had my daughter 5 years ago, from day 1 I placed her on her belly and I saw her lift her head and turn herself. I knew she would be okay. All these ‘rules’ can make child rearing more stressful than it needs to be. I gave no water as they say breast milk has everything they need and I fed on demand, as breast milk is not as heavy as formula. It’s pooped out and peed out of their system much faster. My baby slept on her stomach too and we were co-sleeping! Baby ate every 2-3 hrs. I broke a lot of rules!!! i’m a bed-sharing, babywearing, child-led weaning, homeschooling, super crunchy hippie freak–at least according to other people. 😉 the only rule i followed was to do what i thought best for my baby and my family. in addition, we’re a no-vaccine family so…yeah. rule breakers, all around. and it’s worked wonderfully for us. 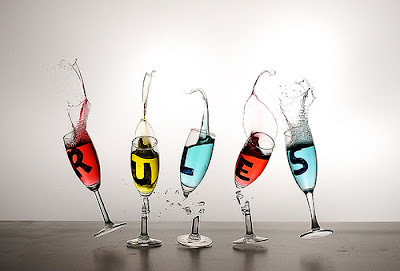 I’m definitely a rule follower for the most part but have surprisingly broken a few rules too. I nurse/bottlefeed my 6 month old every 3 hours (was more often when he was younger). I also give solid foods in between. Some rules I’ve broken: letting him take naps in the bed with us, not sterilizing the bottles after the first few feeds, letting him sip water from my cup (once). I do let him sleep on his back still since it hasn’t been a problem and he sleeps 10-12 hrs at night. I also let him “crawl” around naked. He loves it. I agree that you have to do what you think is best for your baby and your family. I guess I am a rule breaker too! Emma sleeps on her boppy EVERY night! I place her on her back, but she eventually turns on her side! We kept up the feeding schedule until Emma showed she wanted to change it up. You know my situation was different from jump with Emma due to her being in the hospital for so long, and let me tell you that had a rule for EVERYTHING!!! But once we got comfortable we realized she will let you know when she is hungry, how she wants to sleep…and many other things! Just like tummy time, they enforce that so much…well Emma doesnt really like it, my niece didnt either, and my mom said my older sister didnt either…and they turned out okay! I say use your Mommy instinct!!! We definitely break the rules. Baby S sleeps on his stomach… we’re on a different vaccination schedule…I feed on demand… we co-slept the first 4.5 months and still do if he wakes up in the middle of the night. The only thing I will say is give him water. You need water to live right? family. I was wondering about the hep b vac too it seemed so early to be vaccinating a child! Ha! We broke all the rules! I let my babies sleep however they are comfortable. As a newborn, they all enjoyed sleeping on their side. After a while, they prefered sleeping on their tummies. I didn’t give them water until much later. Water is a filler for a baby. It takes up milk space. I did delayed vaccines also…those shots are just too much and I’ve been into the depopulation through vaccination theories. I agree on the diapaerless thing. Free air is the best policy to prevent and heal rashes. Dipaer creams always made the rashes worse, but the air would do the job quickly. Girl. I remember my mother asking me over and over “doesn’t he need water?? ?” Nope. And he didn’t get any until he stopped breasfeeding either. Put him on his stomach. I wish I had followed my instincts and not listened to CDub on that one. Feeding on demand worked for us too. A schedule was too much for my already muddled mind. Let the boy breathe. I did that too. we survived. And there is nothing at all wrong with a delayed vaccination schedule. And that’s a nurse speaking! I don’t nurse on demand though, I do try to do every 3 hours and not too much sooner to let my milk replenish. I think this just depends on your milk supply. Mine is not all that great so I NEED time inbetween feedings to get a bit full again. I have to eat and drink inbetween feedings too.